I would like to start off this series of articles by introducing the basic idea behind it and by providing some general advice when it comes to using popular media such as anime and manga as a part of your study routine. The premise of these articles is pretty straightforward: I will introduce some basic building blocks of Japanese that are integral to getting your foot in the door through examples taken from popular media, hopefully giving at least a few useful tidbits about how to supplement your studies and some ideas as to what resources are available. I am a fierce champion of the autodidact crowd: for the most part I taught myself Japanese while living in Japan, and materials like anime and manga are one way to bolster your self-edification. Of course had I been a better student when I had access to a skilled Japanese teacher, I would’ve had a 7 year head-start on myself; it’s good to remember that good teachers will save you a lot of time and energy spent in wasted effort. And if you’re going for the JLPT I especially recommend finding a tutor/teacher with a background in preparing students for those tests. Getting more to the meat of this discussion, Japanese particles are the quickest way to start understanding and dissecting sentences. A paltry half-dozen is all you need to learn to construct those first essential rungs that will form your ladder from beginning to intermediate to advanced Japanese. If you’re big on anime you’ll need to do a little of each of these because various speakers will tend to omit particles when speaking; this can be true of manga as well but tends to be less of an issue. Don’t let me talk you out of studying vocabulary, but do let me talk you into getting your particles sorted out as a cornerstone. Why particles? Because they identify what the words in a sentence are doing. If we have the sentence “Have you heard of him?” we know what “him” is doing thanks to “of.” Remove that—say for example you have good basic vocabulary but poor fundamental grammar—and we get “Have you heard him?” and the meaning shifts. One final important note is that while in English we have prepositions where our “in”s, “at”s, and “on”s, come before the word they relate to, in Japanese there are postpositions, so these particles I’ve mentioned come after the words they modify. Ok, now let’s get to it! 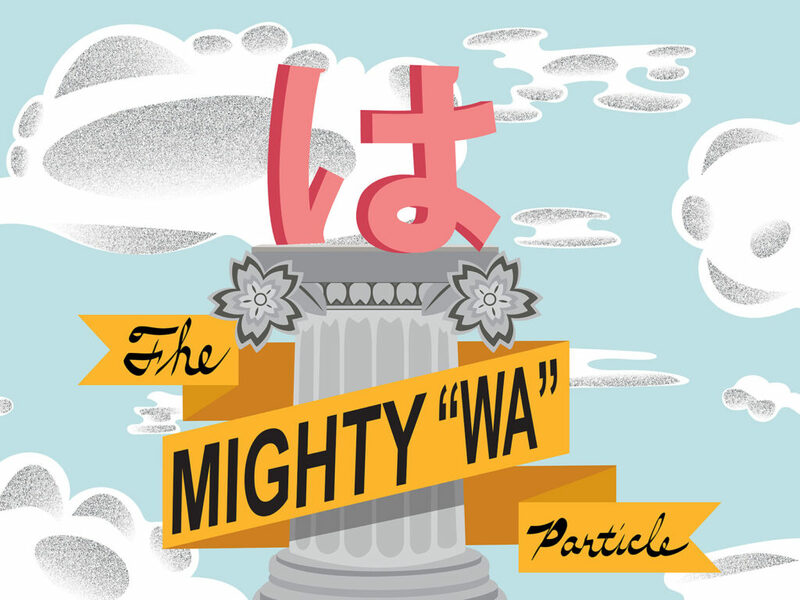 Your first particles coming out of the gate are wa & ga, written は & が (wa is written using the hiragana for ha due to a holdover from the way the language has changed over time). They denote the subject or topic of a sentence, and there is a wealth of discussion online about which to use when. I’m not going to delve too deep into it, but you can do yourself a big favor: when you watch anime or read manga, pay attention to which is used when. We’re going to dive straight into the deep end, focusing on wa—if you’re unsure as to which to use (as opposed to が), in most situations this should be your go-to. The examples for this segment are taken from a manga called Tokyo Toy Box: New Edition, or 東京トイボクス新装版 in Japanese. The story follows a central protagonist who runs a small game studio making video games, and the woman sent by the company that bought them out to make it worth the investment. The comic is by team Ume, also known as Takahiro Ozawa and Asako Seo. It’s a title aimed at a slightly older audience, so I wouldn’t recommend it as your first foray into reading manga as a study tool; however, when I started reading manga I didn’t let that stop me, even though I had to get used to spending 10 minutes working through a single page with a fairly robust kanji dictionary—I said the struggle is real. But it’s a fun series, and if after reading 20-30 pages you find it’s your cup of macha, I can attest to having the right series for you makes the challenge all the more fun and you will appreciate the story even more. I は interesting と think よ. The は you know, the と is another particle that I will mention in the 6th segment of this series, and the よ comes at the end of the sentence to add emphasis; its meaning is like typing in ALL CAPS ONLINE except that it’s spoken…yes you would think speaking volume alone could represent personal enthusiasm but Japanese disagrees. Quite often は gets taught as meaning “am” or “is,” and while that holds true for many cases, it’s important to remember that it isn’t actually a word so much as a grammatical signifier. It tells you what the topic is. If we tried to make it into an English word here, it’d be easy to think the person speaking is saying that he is interesting. But with context we know that he’s actually talking about a game, which we need since the subject itself isn’t mentioned in the sentence. I は hero では not. Let’s just look at the first part of the sentence—everything before では. は can be used to introduce yourself, such as “I am Matt,” but it can also be used for other “I am” statements. While recognizing は can be used like “am” please remember that it really is just marking off “I” as the topic of the sentence. If you can hold both those things in your head going forward, you’ll be off to a good start. As a closing note, you may’ve noticed that both times that “I” shows up in Japanese it’s ぼく (boku); one time it’s written in kanji, and one time it’s written in katakana. This is just an informal, male way of saying I or me. A lot of guys will use it around the watering hole, but it’s a good idea to start yourself off with 私 for “I” instead; it goes for both girls and guys, and it’s a little more formal.